Everybody loves Saratoga Springs, New York in August, and in the worldwide horse business in August, a lot of people pass through town. And others are looking for a reason to go! Thoroughbred racing, Standardbred racing, polo, and yearling sales are just the tip of the equine iceberg. For the third year, Hoofcare & Lameness will be the catalyst to get people together on Tuesday nights with some educational and social activities. We've worked out a schedule that has something for everyone and invite you to join us on Lake Avenue in downtown Saratoga on Tuesdays. If you need a hotel room, we have a special "Hoofcare" rate at the Fairfield Inn in Malta, NY (one exit south); call (518) 899-6900. WEEK 2: Tuesday August 7 at 7 p.m.: Meet Stacey Small, of Equilite and Sore No More products, to talk about leg care. Stacey has worked at the track and has a great deal of experience in the show ring. She is thinking way ahead of us about barn routines, rehab, and health-conscious ways to manage horses. Our headliners that night will be two farriers from Kentucky, Mitch Taylor and Steve Norman, who will take a break from the yearling sales to talk about their work with the Grayson-Jockey Club Research Foundation's Horse Welfare and Safety committee on hoofcare. In particular, they will talk about the committee's study of toe grabs on the front feet of racehorses. They'll share examples of some innovations for racehorse hoofcare and answer questions. Mitch has a terrific PowerPoint presentation with slo-mo video and great images. Ad hoc info session for owners, trainers, and farriers before the Yearling Sales related to the bans some states have initiated against front toe grabs. Members of the committee will be at the Parting Glass to answer questions, share research, and listen. Meet some Hoofcare heroes! Anatomy expert Allie Hayes of HorseScience creates leg and hoof models for vets and farriers to study normal and abnormal anatomy and the structural integrity of the foot. Dr. Frank Gravlee, inventor of Farriers Formula, will be on hand to answer questions about nutrition and laminitis, and sign copies of his new book, "Laminitis and Founder: Prevention and Treatment", co-authored with Dr. Doug Butler. Bring your hoofish questions and concerns to two experts from different ends of the farrier world. Michael Wildenstein is Adjunct Associate Professor of Farrier Medicine and Surgery at Cornell University. He'll talk about foot infections and the new strange sole and wall fungus that is affecting hooves in addition to the usual thrush, canker, and white line disease. Mike is seeing it all at Cornell and is a great teacher. Our second speaker is someone who has seen it all as well, In fact, he's probably seen it all twice. Veteran farrier Bob Skradzio from Pennsylvania is one of America's most admired farriers. He gives the perspective of common-sense solutions to problems, gleaned from more than 50 years of shoeing, and is always a big hit for his friendly, generous nature. This man has legend status, and it is well-earned. 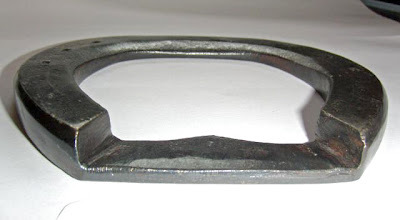 Do you have some interesting old shoes or stable tools? Bring them on the 21st, let's keep history alive! 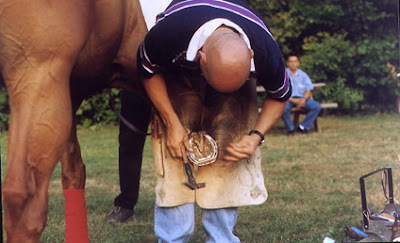 Note: SPECIAL SESSION August 21 afternoon demo program in the shoeing shop at nearby Skidmore College Equestrian Center with Mike and Bob, hosted by Jim Santore. HEARTFELT THANK YOUs: These events could not take place without the support of groups like the Animal Health Foundation and the Jockey Club Grayson Foundation and help from the Parting and the Saratoga Special newspaper. Life Data Labs, who helped the past two years as well, will sponsor weeks 3 and 4. Special personal thanks to key advisers Frieda Garrison and Jim Santore and Hoofcare's growing community of friends and subscribers in Saratoga! If you enjoy these events, credit goes to those organizations and individuals. Please join us if you possibly can. There is no charge to attend these events and I would love to see you. Bring a friend. WHERE IT IS: The Dart Room at the Parting, 40 Lake Avenue, Saratoga Springs, New York. We will be in the private room in the back. There is a big parking lot. WHEN IT IS: Tuesday evening, July 31, 2007 7-9 p.m.
WHO IS SPEAKING: Don Walsh DVM of Homestead Equine Hospital in Pacific, Missouri, and director of the Animal Health Foundation (AHF), a funding organization dedicated to laminitis research and education. WHO IS INVITED: Vets, farriers, horse owners, trainers, grooms, vet technicians--Anyone interested in helping horses that are affected or anyone interested in helping prevent this disease. WHAT IT COSTS: There is no charge to attend; donations to the AHF would surely be welcome and go directly to research. WHAT TO EXPECT: This is an informal event. The Parting Glass's restaurant will be open if you are hungry or thirsty. SPECIAL NOTE: We hope to have information for local owners about the recent Potomac Horse Fever-like symptoms in the area and especially the laminitis that sometimes comes with it. With luck, Michael Wildenstein, the farrier at Cornell vet school, will make the trip and give some insight into the many cases of PHF-aftermath laminitis that are being treated there and how you can handle a medical emergency situation with your farrier's and vet's help. Note to Our Friends in the Saratoga Region: Many of you attended Dr. Walsh's laminitis info session last year in Saratoga, and he is looking forward to seeing you again...and asks that you please bring your friends! A lot has happened in the past year, particularly in the area of insulin resistance, obesity, and grass laminitis, as well as the use of cold therapy to prevent laminitis. Dr. Walsh has some new studies and some broader views on predictive factors in high-risk horses. He also has news from research funded by his organization by Dr Pollitt in Australia. This is sure to be a fascinating presentation and we thank Dr. Walsh for making the trip. Note: Neither Dr Walsh nor Hoofcare & Lameness has any ties to commercial products. This is strictly an educational and social evening, no commercials! Updates (cancellation, natural disaster, or changes) will be posted here. HEARTFELT THANK YOUS: These events could not take place without the support of groups like the Animal Health Foundation and the Grayson-Jockey Club Research Foundation and help from the Saratoga Special newspaper. Life Data Labs, who helped the past two years as well, will sponsor weeks 3 and 4. Special personal thanks to key advisers Frieda Garrison and Jim Santore and Hoofcare's growing list of friends and subscribers in Saratoga! If you enjoy these events, credit goes to those organizations and individuals. See you on Tuesday...and the next Tuesday...and the next...and the next for those readers lucky enough to find themselves passing through Saratoga this summer! Photo courtesy of Dr. Chris Pollitt and the Australian Equine Laminitis Research Unit, which is funded in part by the Animal Health Foundation. Researchers at the University of Tennessee are asking horse owners to donate a horse to research if it is overweight or has a cresty neck and suffers from founder (laminitis). This group is studying new ways of managing insulin resistance and preventing laminitis in horses, including assessment of SmartControl IR, a dietary supplement manufactured by SmartPak, LLC. Donation of your horse will result in a permanent transfer of ownership of the animal. Interested owners should note that the value of the donated horse can be listed as a charitable contribution for tax purposes up to $5,000. Procedures used in the research studies will be minimally invasive and all work will be approved and monitored by the University of Tennessee Institutional Care and Use Committee. Studies will be conducted by Dr. Nicholas Frank, a veterinarian and associate professor at the University of Tennessee. Please contact Dr. Frank via e-mail at nfrank@utk.edu or Sarah Elliott (research technician) at (865) 974-5701 if you are interesting in donating your horse. a. Must be a gelding (preferred) or mare. Stallions cannot be accepted. 2. Morgan horses, Paso Finos, and Arabians are preferred. Ponies, draft horses, miniature horses, mules, and donkeys cannot be accepted. 3. Horses must be donated to the University of Tennessee with complete release of ownership. 4. Horses cannot be purchased, but shipping expenses will be paid if necessary. Further information can be found at www.vet.utk.edu/cemr/donations. 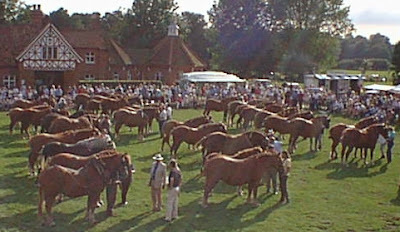 NEWS FROM ENGLAND: The Suffolk "Punch" breed is unique in having competitive classes at shows for the horse with the best feet, with cups being presented to the winners of these classes. 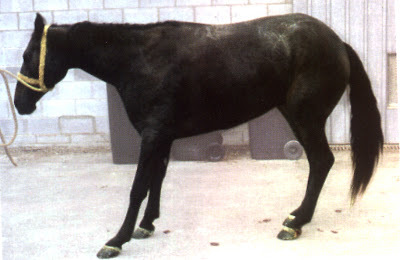 These classes were introduced at the beginning of the last century when the breed had been criticized for having poor feet which were not able to withstand work on city streets and these competitions rapidly improved foot quality so that today Suffolks have very good feet. At this year’s Suffolk Show the Supreme Champion in the "Best Feet" classes and the winner of the G Philip Woodward Perpetual Memorial Trophy was the five-year-old gelding Novello, the property of veterinary surgeon Phillip Ryder-Davies, Chairman of the Examination Board of the Worshipful Company of Farriers and shown by veterinary surgeon Ben Ryder-Davies. The judge was farrier Dennis Hayter. The horse also won the best shod Suffolk Horse competition, judged by Yorkshire heavy horse farrier Danny Mallender AWCF. The gelding was shod by Roger Clark FWCF (Hons), a member of the Company’s Examination Executive Group, and received a special plaque presented by the company to celebrate its 650th anniversary. Translation: the horse was judged to have the best feet and best shoeing of all horses in the show in the eyes of two different judges in two different competitions, with slightly different criteria (best feet vs best shod). I don't think that Roger has ever heard of Equilox. 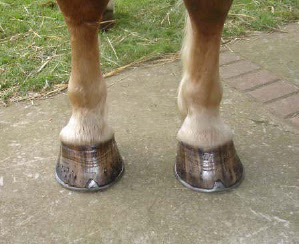 You are looking at the horse's real feet. If the names of Ryder-Davies and Clark sound familiar to the Hoofcare and Lameness community, it is because they journeyed to America to speak at our conference on heavy horse hoofcare held at Tufts University's Cummings School of Veterinary Medicine in 2003. They were (and obviously still are) superb experts on the foot of the heavy horse. I would recommend them most highly to anyone interested in continuing education on the foot of the heavy horse. Have things changed? 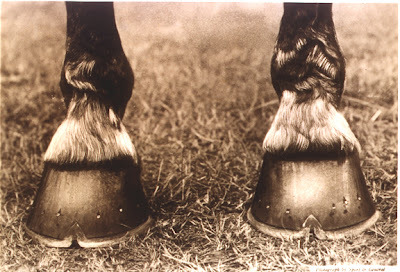 This is the Suffolk breed's photo image of the ideal feet, circa 1930, which accompanies an article by Roger Clark soon to be published in Hoofcare and Lameness Journal. It looks like Roger is sticking to tradition. The Suffolk Punch is officially a "rare" breed and considered "category 1" on the endangered list; there are only 300 Suffolks in all of Britain. In 2005 the Suffolk Horse Society registered 37 pure bred Suffolk foals. Luckily, the breed is considered a regional treasure of the East Anglian county of Suffolk, northeast of London and some breeders and farmers tirelessly promote the breed and keep foals coming each year. Below is the scene at a Suffolk show; I think if you own a Suffolk in England, you are obliged to show! If you're in the mood to hunt down a wonderful book that is out of print, look for "Pulling Punches" by Paul Heiney. It is the story of a year on Roger Clark's farm and in his forge; or, order the new video/dvd about him called "A Man for All Seasons"; get an idea of what being a horseman is all about. Thanks to the Worshipful Company of Farriers' terrific new web site and Suffolk Horse Society's wonderfully educational site for their help with this post. Harness Tracks of America’s 30th anniversary art catalog, featuring works of horse racing and sporting art from the estate of the sport’s legendary Stanley Dancer, is now online. It can be viewed at http://www.elegantequineart.com. The sale will be held from 8:30 a.m. to 11:45 a.m. on Saturday morning, October 6 (Kentucky Futurity Day) in the Tattersalls Sales Arena in Lexington, Kentucky. On sale will be 158 works by American, Canadian, European and Asian artists. The online catalog permits enlargement of each work simply by clicking on the art's picture. Most of the art is Standardbred or Thoroughbred racing, but there are some lovely pieces by George Ford Morris, the famous illustrator, including a portrait by him of a draft stallion, which I had never seen before. There are also some books, Saturday Evening Post magazine covers, gold-plated shoes from champion Donerail, and a vintage Capewell calendar. I've just had a peek at the specimen shoes for the International Team Competition at Stoneleigh in England, to be held August 23-26. The sheer number of them and the technical specs make a chilling homework list for invited farrier teams. What you are looking at (above) is a setdown bar shoe, which would be difficult enough but this one is also graduated from toe to heel. So the branches have to match. But with the bar set down, even the 3-d is 3-d.
Stoneleigh is probably the world's most coveted farrier competition. It is contested with chilling determination and fortitude by invited nations. Have a look for yourself, the shoes are posted on the NAFBAE website. I couldn't even draw these shoes to spec, let alone attempt to forge one. They are an intimidating lineup of asymmetric and 3-D conundrums. The shoe below is a (very) square toe egg bar with interesting placement of the clips. Note: the transcript below is from the Federation Equestrian Internatioanl (FEI), the ruling body of worldwide Olympic-discipline horse sports. The case invovled a US rider at the Rolex Kentucky Three-Day Event whose horse broke down at the finish of the cross-country course and was subsequently euthanized. At question was whether or not the rider abused the horse by continuing on course after the injury happened. This has been a hotly debated issue in the horse world. The FEI Tribunal has taken its decision in the case of alleged horse abuse committed by US rider Amy Tryon on her horse Le Samurai while participating in the cross-country phase of the 2007 Rolex Lexington Kentucky 4-Star Event on 28 April 2007. The dilemma which the Tribunal had to resolve was a very difficult one. The main issues to be decided were (a) whether the competitor committed an “abuse” as this term is defined under the applicable rules (see note to the editor) and, if an abuse was committed, (b) whether it was an intentional act or an unfortunate omission to take action and stop the horse, as signals of discomfort were not correctly perceived by the competitor. The Tribunal came to the conclusion that the competitor's behaviour at the end of the cross-country phase of the event objectively constitutes abuse according to the requirements of the applicable FEI regulation. 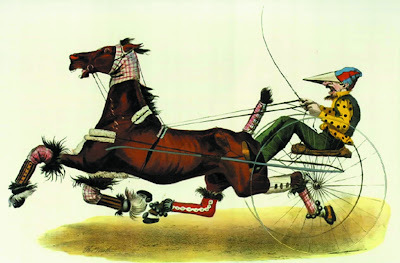 The competitor acted, by continuing to ride after the horse was objectively lame and injured. Conversely the competitor omitted to act, by failing to pull up the horse when she could have. 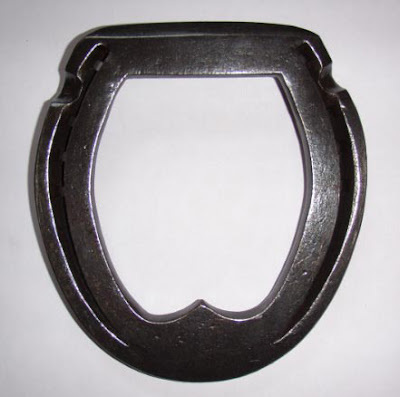 This caused or was likely to cause pain or discomfort to the horse. The Tribunal expresses its opinion that “abuse of horses constitutes an offence that violates the most fundamental rules of the equestrian sport and is, as such, highly reprehensible from a moral point of view”. The Tribunal determined that, had “the competitor intended to ride a lame or injured horse, a suspension for life would not have been an inappropriate or a too severe penalty”. The state's new toe grab regulations are consistent with the model rules adopted by the Association of Racing Commissioners International (RCI) at its convention in Jackson Hole in April 2007. California was the first state to initiate a front grab ban and was soon followed by New Mexico. Hoofcare and Lameness Journal will facilitate a discussion on the toe grab recommendations during the Select Yearling Sale at Saratoga on Tuesday, August 7th. Featured speaker will be Kentucky farrier educator Mitch Taylor, who will present research and findings compiled by the committee. With Mitch will be Kentucky farrier Steve Norman, who also served on the committee. The public is invited to review the findings and discuss toe grabs and racing surfaces (and anything else) with Mitch and Steve. 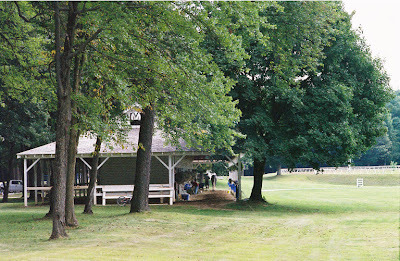 All Hoofcare & Lameness events at Saratoga this year will take place in the dart room at the Parting Glass on Lake Avenue. Mitch will make a formal presentation on this subject at the Fourth International Equine Conference on Laminitis and Diseases of the Foot on November 2-4 in West Palm Beach, Florida. Visit http://www.laminitisconference.com to learn more. Dr. Hannah Galantino-Homer has been appointed the senior research investigator of the newly created laminitis research initiative at the University of Pennsylvania School of Veterinary Medicine. Dr. Galantino-Homer will serve as a leading investigator in Penn Vet’s laminitis research efforts. The appointment was effective July 1. Prior to her new appointment, Dr. Galantino-Homer was a lecturer and researcher in the Center for Animal Transgenesis and Germ Cell Research, located at Penn Vet’s New Bolton Center. Construction has begun on the equine medical facility at Belmont Park. The ground-breaking ceremony was held on Friday afternoon. According to project developers at IAEH, the scope of the project has grown substantially and the intended $7 million project has grown to more than $15 million, and the size of the facility has more than doubled. The facility will provide a wide array of diagnostic imaging, multiple surgical suites, treadmill endoscopy, full chemistry lab, and pharmacy. The practice will be headed by Dr. James Hunt, who will oversee the practice; he currently cares for more than 60 percent of the Belmont Park equine population, according to IAEH. Surgery will be enhanced with the services of Dr Patty Hogan. 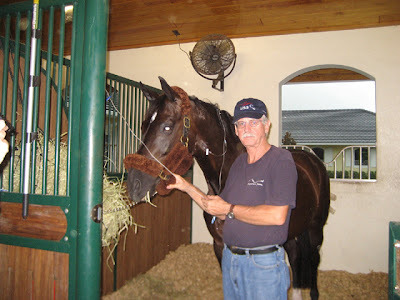 Dr. Hogan was the recipient of the 2005 President's Award for performing potentially life-threatening cranial surgery on Smarty Jones, affording that colt the opportunity to become a Kentucky Derby winner. She also gained national recognition when she surgically repaired a hairline condylar fracture of the left front cannon bone suffered by multiple Grade 1 winner Afleet Alex. Dr. Hogan intends to lend her talents to up and coming surgeons. The plan is to grow the practice from within and have young surgeons learn their trade under the tutelage of Dr. Hogan. The facility also would like to work closely with area veterinarians and will strive to become the top referral clinic in the northeast. Fox Sports New York (FSNY) will feature IEAH Corporation's groundbreaking for the equine medical facility on its “Inside Racing” program which will air today at 6:30 p.m. Here's a familiar face to anyone in the sport horse world. 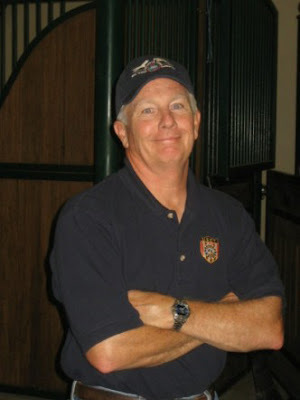 Rick Mitchell DVM is one of the founders of Fairfield Equine Associates in Newtown, Connecticut. Fairfield is considered one of the most high-tech practices in the East and certainly has one of the most sophisticated clinics and equipment. The practice is devoted exclusively to lameness diagnostics. Dr Mitchell has been "team" vet for the USA for several international FEI-level events and is the vet for the dressage team this year in Brazil. Dr. Mitchell at work on US dressage team horse Sagacious HF, an eight-year-old Dutch Warmblood gelding who is currently at the top of the leader board at the end of the first day of competition at the 2007 Pan Am Games in Brazil. Holding the horse is Mae Williams, who is Lauren Sammis's groom. She formerly worked for Hyperion Farm, owners of the horse, and was a working student at Knoll Farm on Long Island, home of dressage trainer Anne Gribbons. Apparently there was some concern about equipment at the new equine hospital at the equestrian center in Brazil, so Team USA did not "travel light" when it came to the list of supplies and vet equipment to pack. Here you see Dr Mitchell and his wife Julie unpacking the "vet box" on arrival. Among the gear is a complete spare set of shoes for each horse. 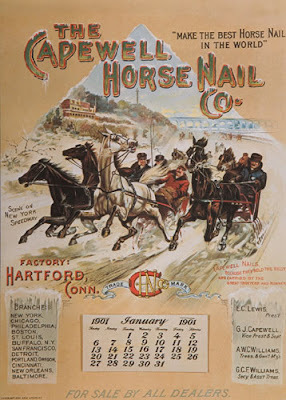 I believe most or all of the horses were shod by Wellington, Florida farrier (and Hoofcare & Lameness Journal subscriber) Don Later while they were in quarantine in Wellington. Thanks to Lauren Sammis of the USA dressage team for sending home these photos! 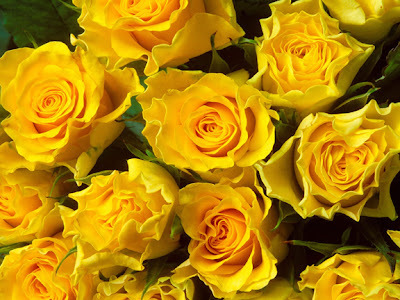 Two dozen yellow roses showed up at Hyperion Farm in Wellington, Florida recently. They were addressed to Sagacious HF, the eight-year old Dutch Warmblood gelding owned by Hyperion Farm's Al and Judy Guden. The horse will compete for the USA tomorrow in the dressage at the Pan Am Games in Brazil. And they were signed by a horse that knows a whole lot about roses: 2007 Kentucky Derby winner Street Sense. The roses were a token of good luck from one champ to another but also testimony to an old friendship. The Gudens switched from owning Thoroughbreds in New York to owning dressage sport horses in Florida when the moved south but Judy Guden went to school with Street Sense trainer Carl Nafzger years ago in West Texas...hence the yellow roses! Al Guden emailed me tonight with this insight into one of America's top sport horse owners and one of America's great Eclipse Award-winning Thorougbred trainers: "Judy and Carl went to school in Olton, Texas from the first grade right through high school. They graduated together in a class of 42!" He continued, "Carl trained race horses for us for a number of years. We had an Unbridled mare named CEO Sis who had a short and successful career and she produced one horse that we race and won a few more races." Carl and his wife Wanda recently visited Hyperion Farm to wish the Gudens well. Street Sense by the way will be a shut-in (probably literally) this weekend while Churchill Downs hosts a Police concert. Once that is over Street Sense will head to Saratoga; his arch-rival Curlin arrived there yesterday. There's another connection here; both Judy Guden and Al Nafzger were friends with the late great laminitis specialist farrier Burney Chapman from Lubbock, Texas. Judy says that Carl still stays in touch with Burney's sons, who are all farriers. Carl used to shoe his own runners back in the days when he was training Quarter horses at Ruidoso Downs in New Mexico, Judy says. The Gudens and Hoofcare and Lameness Journal became friends when Burney died in the late 1990s. For all those reasons and more, I'll add my best wishes to those of Street Sense. Let's hope that Sagacious HF and his rider Lauren Sammis shine in the Brazilian sun tomorrow! The Gudens will be waiting for a call to tell them how their horse does in the big arena tomorrow. Judy opted not to attempt the trip as she is completing another round of treatments for ongoing breast cancer therapy. Lauren Sammis's saddle cloth (below) says so much about the caring spirit of this rider, the courage of such a young horse to represent his country overseas, and what we all hope will be the joy of a proud owner who loves her horse. That horse has a lot riding on him; win or lose, he's brought the Games into perspective for many of us. Commentary: the two top offices of the AFA are unopposed unless someone decides to mount a write-in campaign. A total of 31 people stepped forward to serve on the AFA's new regional board of directors. I think that there will be three elected from each region. Region 3 (midwest and Ohio) has the most candidates with nine. Twenty out of 31 (65%) of the Board nominees are certified to the journeyman level in the AFA. Only three hold no certification level at all. One person, Rick Burten, is a candidate for both Treasurer and The Board. Six states had two candidates each: Massachusetts, New York, Tennessee, Indiana, Oklahoma, and California. Two former AFA presidents are on the list: Bruce Daniels and Walt Taylor. Biggest surprise: former certification czar Dennis Manning is a candidate for the board. Of interest (but I don't think this means anything): Toolmaker Roy Bloom, FPD clinician Dave Farley, Mustad consultant Steve Kraus, AFA magazine editor Danvers Child, and GE Tools tech expert Dan Bradley would bridge over to the industry-side of the AFA if elected. In fact, if all five are elected, they would make up one third of the board. Of great interest: Stan Davis is running against Steve Davis in District 4. That might confuse some people! Perhaps of no consequence: no one from Florida, Virginia, Maryland, Pennsylvania, Kentucky, Colorado, Montana or Washington is a candidate for the Board. These states were traditionally strongholds for the AFA. Times do change. Region 5 Directors: Deborah Ash, CF, #2403, NH; Bruce Daniels, CJF, #460, NH; Mike Givney, CF, #5420, NY; Steve Kraus, CJF, #360, NY; Sean McClure, #7907, MA; Jack Millman, CJF, #1489, MA. The numbers all added up today. With concerts in New York, London, Johannesburg, Rio, Shanghai, Tokyo, Sydney and Hamburg, a new age of global media events was born. Here's the official video, with Madonna's catchy new tune. The pictures flash by really quickly but yes, there's a horse in there. A zebra, too! 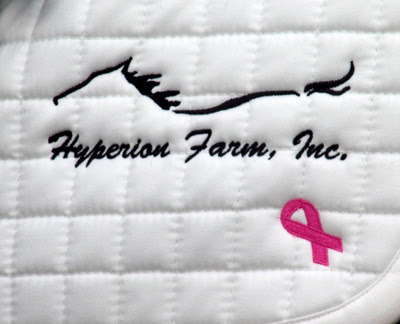 The pink ribbon on the Hyperion Farms saddle cloth signifies Judy Guden's long struggle to beat breast cancer. Judy is from Lubbock, Texas and an old friend of the late farrier Burney Chapman. Al and Judy Guden are the nicest people I've never met. About ten years ago, I sent out an email announcement to Hoofcare and Lameness Journal subscribers to tell them about the death of Texas laminitis specialist farrier Burney Chapman. I was surprised to hear from Al Guden, the owner of a Thoroughbred racing stable on Long Island who asked if he could post my bio of Burney on his web site. I was even more surprised to see that his web site was the first on the Internet to be dedicated to laminitis. It was filled with links and names and where to go and what to do if you had to deal with the disease. By email, Judy, Al’s wife, was from Lubbock, Texas and they had brought Burney to Long Island back in the 80s to try the heart bar treatment on their foundered horse. But the contact didn’t end there; I kept sending people to the Hyperion Farm web site. And Al started offering me some friendly advice on web technology. Before long, he had taken over the Hoofcare and Lameness email list and added all sorts of enhancements. And he wouldn’t accept payment, even after he had to hand-sort out all the America On Line addresses. Al and Judy retired and moved to Florida. They gave up Thoroughbreds in favor of Dutch Warmbloods. They have the farm in Wellington and all the trimmings, but have remained interested in hooves and horseshoes and laminitis and still offer me help and advice (and boy, do I need it) on technology and horses and the international scene. In the past few years, they have been on the ownership side of some of the top Dutch Warmbloods (KWPN) in the world, including the young dressage breeding champions Uptown and New Holland and now Washington. In Europe, their horses are ridden by Hans Peter Minderhoud. Al could write a book about the health problems he has encountered with his horses. More importantly, at the same time that his horses were soaring to the top, Judy Guden was on the sidelines, battling breast cancer, in recent years. Yesterday, Al and Judy's eight-year-old US-based gelding, Sagacious HF, the mount of New Jersey rider Lauren Sammis, flew to Rio de Janeiro in Brazil to represent the USA at the Pan Am Games. Lauren has brought this horse from training level to Prix St Georges. Lauren qualified for the Pan Am Games with a pink ribbon for breast cancer awareness sewn into her saddle cloth in Judy's honor. She’ll now trade it for the USA emblem of the US Equestrian Team. I’m sure Judy approves of the switch. If you have a minute to turn your thoughts toward Brazil next week, check the web site http://www.hyperionfarm.com. (The Thoroughbreds may be gone but the farm name remains rooted in the racing lore of the great racing sire Hyperion.) Al will keep us filled in on how the horse is doing. Sagacious HF is shod by Don Later; his vet is Dr Rick Mitchell of Fairfield Equine Associates in Newtown, Connecticut (and the world). The bad news: Al and Judy will be at home in Florida while their horse competes in Brazil, since Judy is going through another chemotherapy series of treatments. Hoofcare and Lameness has survived for 20 years because of people like Al Guden: busy people who somehow were never too busy to stop and look and see that the journal/website/blog/bookstore needed help with our educational mission and they had the expertise to give it. People like Al Guden have had answers for me before I even knew I had questions. I admit that I had to open the dictionary and look up the exact meaning of Al and Judy’s horse’s name. They’ve had him since he was four months old, so I know they named him. Sagacious means having sound judgment and farsightedness, keen perception. I can understand why Al Guden would know that word. By the way, Hyperion was euthanized because of laminitis. He remains one of the most influential sires in Thoroughbred history and is at the head of bloodlines like the Northern Dancer line. Al Guden with his gelding Sagacious HF. If you double-click on the image and view this photo in an enlarged window, you will see that the horse is hooked up for IV treatment. He is not sick; a few hours before the horse was to leave for the airport, veterinarian Rick Mitchell began to hydrate all the Team USA horses with 10000 mL of saline along with some vitamins, according to Al. Big news published by the Daily Racing Form today: A recent raid of the tack room of French trainer Patrick Biancone at Keeneland Racecourse in Lexington, Kentucky netted a little vial marked "Toxin". Inside was a small amount of crystallized cobra venom. His veterinarian's truck was also searched. Cobra venom injections are legendary at US racetracks but there has been little proof until recently that they are anything more than legends. Think: an injectable temporary chemical neurectomy. The DRF describes: "Cobra venom is a powerful neurotoxin that blocks the neural pathways that transmit pain to the brain. The substance, which is used by researchers in extremely minute quantities because of its toxicity, is considered a Class 1 drug under the Racing Commissioners International classification system." Last week, two men pleaded guilty in New York state for the crime of injecting Standardbreds with cobra venom. Lyndi Gilliam, DVM at Oklahoma State University Center for Veterinary Health Services is working on a test to detect cobra venom in horse urine but apparently there is no current test to detect it. Another rumored painkiller used in horse's feet is the oceanic cone snail's venom. Cobras are intensively farmed in Viet Nam; their meat is also eaten. One farm exported 50 tons of cobra meat to China last year. Cobras are almost extinct in the wild because they are so valuable on the Chinese market. In Florida, there are several cobra "farms" as well, primarily producing venom for research use. Cobra venom is deadly, of course, if a human or horse is attacked by the snake. But did you know that cobras themselves are immune to the venom? Their bloodsteams contain molecules that neutralize the venom. And the molecule is based on a single amino acid. That's the only difference. The amino acid creates a sugar molecule that prevents the neurotoxin from affecting the snake. National Geographic has a great article about cobra venom research and all it may teach us about human medicine. 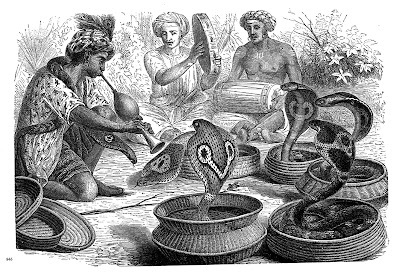 Tell me this: if cobras are valuable snakes, who has the job of milking them? And how do they do it? Who in the World Is Reading This Blog with You? Almost half of North American visitors are in the eastern time zone; 25 percent are in the Pacific time zone of North America. I guess I'll have to work on Central and Mountain time zone states and provinces! If anyone's keeping track, the busiest month ever was May 2007, with June close behind. The busiest single day was on Tuesday, May 1st. That was the day we covered the sad death of Le Samurai, the horse with ruptured suspensories at the Rolex Kentucky Three-Day Event and described what an elevator shoe was. It wasn't enough for Le Samurai, I guess.